When I heard that this Deep Sea Exploration voyage was going to have a remotely operated vehicle (ROV) working in addition to scuba divers, I was so excited! To be able to watch the operations and meet the people who do the work has been a particular fascination for me on this voyage. I’ve always loved the exploration of the ocean using vessels that can go where humans have limitations. The big yellow Kraken 2 sits on the stern of the R/V Norseman II. It is a modified ROV that has been customized for special tasks in science research. 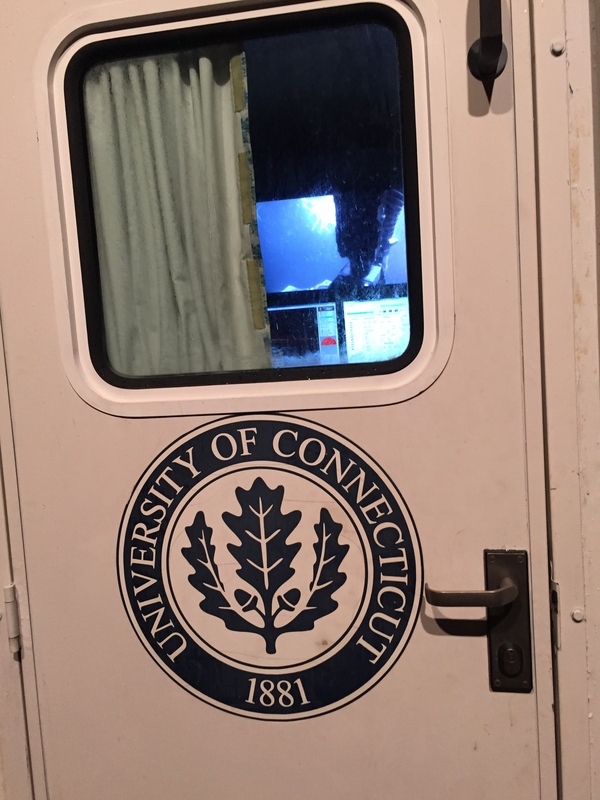 Kraken 2 is owned and operated by the University of Connecticut. Kraken 2 is usually contracted to do science research for the U.S. government or University clients, but has also done a few jobs of surveying and archaeological work on shipwrecks. 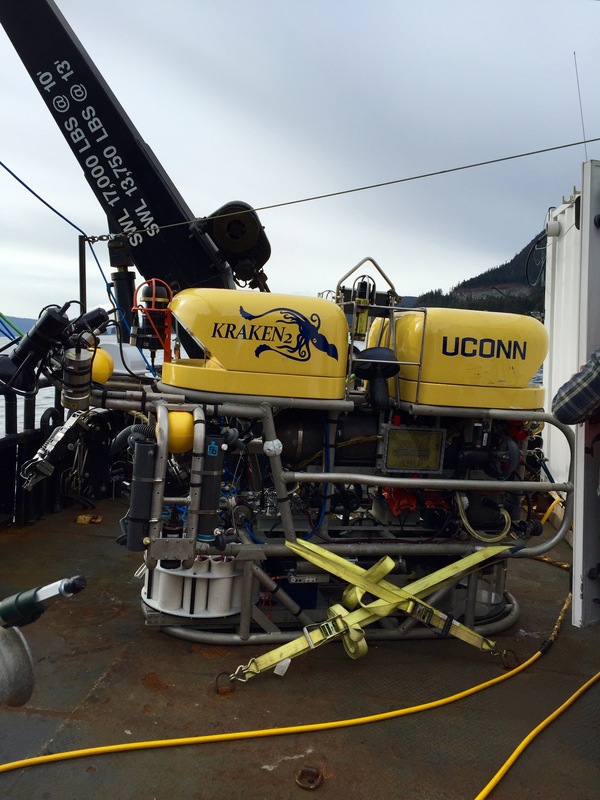 Kevin, Matt, Eric, Mike, and Jeff are the members of the ROV team for this voyage. These cool guys have an eclectic background of geography, marine ecology, and engineering coupled with a love of electronics and the computer side of things. -The big yellow top made of syntactic foam that provides 900 lbs. of buoyancy, which helps maintain neutral buoyancy in water. -Kraken 2 is tethered to the ship by the green umbilical, which provides power and communications between ship and ROV. -Kraken 2 carries a number of cameras and lights. Big high intensity lights that provide warm light deep underwater. -Kraken 2 uses a number of High Definition video and digital still cameras – similar to a camera you might have at home. The video camera has been deconstructed and put into a canister that can withstand high water pressure. 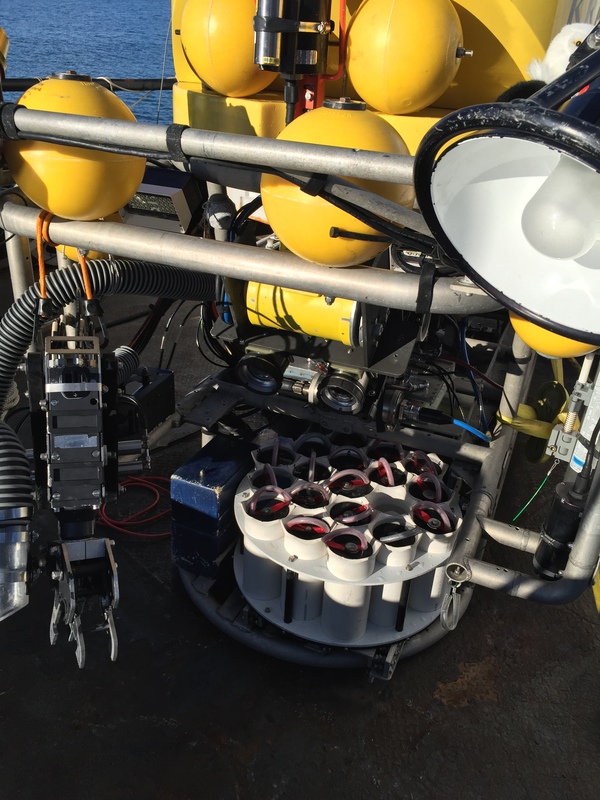 These are positioned to get various angles and provide different views around the ROV. -When the visibility is not good the operators rely on sonar. This allows them to “see with sound” what is in front of Kraken 2 up to 100 meters and helps them make maneuvering decisions. -An altimeter, which measures height off the bottom and a pressure sensor that determines depth. -The USBL (ultra short baseline) tracking system has a transducer that emits sound pulses and transponder that receives and sends a pulse back. It can track the vehicle in relation to the ship. All these sound devices are important in marine navigation for obstacle avoidance. -The manipulator arm is sometimes called the claw. It is very important for collecting samples such as pieces of Primnoa pacifica. An acrylic vacuum tube is also attached onto the arm for “sucking” up moving or delicate samples such as fish and jellyfish. The manipulator arm is used to put samples into quivers then drops a heavy rubber stopper on top to seal it until it is brought to the surface for scientific processing. There are three people working to “drive” Kraken 2 during deployment. The winch driver gently lifts Kraken 2 from the ship’s stern into the water and also keeps the ROV from crashing into the bottom of the ocean. The pilot is working on the finesse of getting into delicate areas. The navigator operates the claw while maintaining a close dialog with the Bridge. The cameras, radar, and sonar monitors along with the remote controls are all house in a metal shipping container called the Van. Matt and Mike drive the ROV from within the van. The Science Leader in the last picture is Cheryl. Kraken 2 is a unique ROV for the niche it occupies. It is a science class ROV. Most Science Class ROVs are large about the size of a small truck and require a dedicated ship and personnel. The advantages of Kraken 2 are that it doesn’t go as deep (up to 1 km) therefore, isn’t as expensive. Smaller ships can deploy it. It’s an excellent ROV for continental shelf and slope exploration. One night Qanuk got to go down with Kraken 2! Mike attached him to the frame. He is probably the first bald eagle to ever attempt such a feat. Qanuk was videoed as he explored the depths and even had his photo taken with Primnoa pacifica in situ. Qanuk as seen through the ROV camera! Today concludes my voyage as a NOAA Teacher at Sea. Wow! 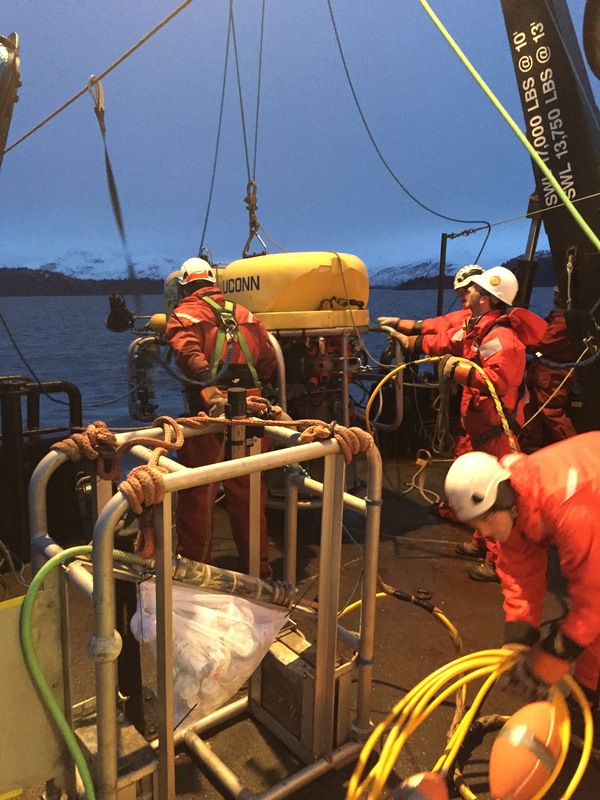 It has been amazing to be a part of the Deepwater Exploration of Glacier Bay. Getting to work alongside scientists, engineers and ship’s crew that are doing adventuresome and cutting-edge work is a dream come true for me. A special “Thank you” to Dr. Rhian Waller, as Lead Scientist for accepting a Teacher at Sea on board to work with her project. I am so thankful that they all welcomed me into their work space and were willing to teach me how to do some helpful things like processing coral for reproductive studies. These people are teachers in their own right. Their enthusiasm for their work and for learning new things is infectious and I plan to carry that attitude back to my students in Scammon Bay, infusing my classroom with awe and excitement to be brave, conscientious, problem-solving citizens of our magnificent Earth! This entry was posted in 2016, Mary Cook 2016, NOAA Teacher at Sea and tagged Alaska, camera, Kraken 2, Mary Cook, Norseman II, ROV, technology, underwater. Bookmark the permalink.